Working in a control center built into Glenwood Canyon on Interstate 70 about 9 miles east of Glenwood Springs, workers constantly monitor traffic along one of the nation’s most beautiful stretches of interstate. The four-story facility at the Hanging Lake Tunnels is staffed at all times and hosts a fleet of firefighting and road maintenance vehicles. 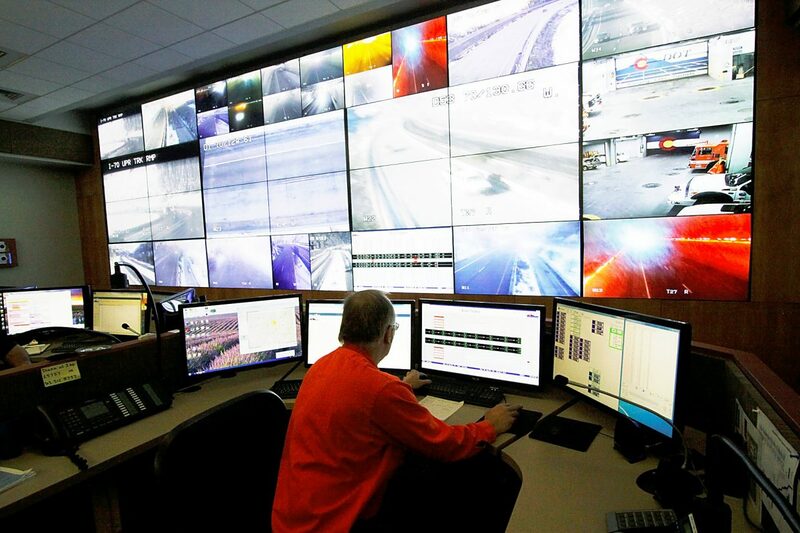 A wall of the main control room enables the Colorado Department of Transportation to watch the entire canyon via remote-controlled cameras. Although technically responsible for only the tunnels themselves, crews stationed at the center often assist other agencies with accidents, breakdowns, rockfalls and the like. The tunnel crew responded to more than 400 incidents last year, said junior foreman Spencer Dickey. An engineering marvel that was the last piece of the interstate highway system to be completed, in 1992, I-70 through the canyon can be a significant chokepoint. All or part of the 12-mile section of Interstate 70 through Glenwood Canyon shut down at least seven times in both 2012 and 2013, creating traffic frustration at least and exacerbating medical emergencies at worst. Most recently, westbound I-70 was closed for almost eight hours on May 8 while authorities investigated the scene of a shoot-out between two state troopers and a Montrose man with a long criminal history. Eastbound lanes were also closed temporarily. It was a hectic traffic jam and, in spots, tempers flared. “People were just out of cars all over the road,” said Tracy Trulove, communications manager for CDOT’s Region 3. While the shoot-out that wounded Trooper Eugene Hofacker and left his alleged assailant Thomas Ornelas dead was an extreme incident, sharp curves and icy bridges give the highway its fair share of accidents despite divided lanes and an often-ignored 50 mph speed limit. In many places there’s barely room for the highway and a bike path between the Colorado River and the canyon walls, which frequently shed rocks the size of softballs and occasionally drop a boulder the size of a Volkswagen Beetle. According to the Colorado Department of Transportation, a rock makes it past the retaining fences and falls into the road every few days, but results in vehicle or road damage only every six months or so. In February 1995, a boulder crashed into a car and killed a woman and her two sons, with the husband surviving. On Thanksgiving 2004, 1,200 metric tons of debris shut down the road for three days and required nearly $2 million in repairs. In March 2010, a large rockfall in the same section of cliff closed the highway again. “They’re supposed to be 500-year events, and we had two six years apart,” observed Larry Carver, who works in the Hanging Lake Tunnels control center. Although Glenwood Springs, straddling I-70 and serving as the gateway to the Roaring Fork Valley via State Highway 82, is far from the most remote town on the Western Slope, most residents have learned to treat being cut off from the rest of the state for hours or even days at a time as a matter of course. On the road, drivers have little choice. During the shooting closure, many travelers found waiting preferable to the alternatives. With Independence Pass closed for the season, the primary alternate route from Denver to Glenwood is north through Steamboat Springs, twice as long as the 150-mile I-70 route. Lynn Burton, editor of the Sopris Sun, opted to tackle Cottonwood Pass between Gypsum and Carbondale in an effort to deliver his paper, but CDOT discourages use of that route as an I-70 alternative, particularly for semis. Greg Fulton, president of the Colorado Motor Coach Association, said the lack of alternate semi routes is a conundrum. When an accident or incident does close down the highway, freight often sees the biggest impact. During some long closures, produce and other fresh goods have become scarce in local groceries stores. A representative from Kroger, which operates the grocery chain City Market, said the company has contingency plans to prevent shortages in the future. Still, routing around a closure can be extremely costly. When drivers reach their “hours of service” limit, they are obligated to rest for 10 hours before continuing. Fulton also is willing to give the engineering in the Glenwood Canyon its due. “It’s a miracle that it’s there, and it was beautifully done,” he said. The Colorado Division of Highways originally considered several options to “close the gap” in the mostly complete I-70 from Baltimore to Utah, including routes over Cottonwood Pass and the Flat Tops. At the time, Glenwood Canyon hosted two-lane Highways 6 and 24, which mostly followed the course of a 1902 wagon road. The Rio Grande Western Railroad, completed in 1887, occupies the opposite bank, leaving little room for a four-lane highway. The Colorado Division of Highways’ Location Study Report estimated that sending the interstate over Cottonwood Pass would cost around $77.7 million, compared with $65.2 million for Glenwood Canyon. It would also have required the acquisition of three times the land, displaced 125 families and business, and had numerous other impacts along the route, particularly in Glenwood Springs. “Required right of way would wipe out a substantial segment of residential area and, in effect, bisect the town,” the report read. The study also dismissed a proposal for 42.1-mile climb north over the Flat Tops due to the risk of “extensive environmental damage,” the challenges of high elevation and a $338 million price tag. In the end, the Division of Highways joined 26 other organizations, including the city of Glenwood, the city of Grand Junction, Garfield County commissioners, Rocky Mountain AAA and Colorado Motel Association, in recommending the canyon route. The Rocky Mountain Center on Environment and the Pitkin County Democratic Executive Committee were the sole holdouts in favor of Cottonwood Pass. The report recognized potential environmental impacts but regarded the option as the least of three evils. “Good design, both conceptual and factual, will reduce these effects to a minimum,” it asserted. The scenic vistas through the canyon certainly played a role in the decision as well. “Since ‘driving for pleasure’ is by far the most important recreational pursuit enjoyed by people today, the most pleasurable route should be chosen,” the report read. The same features that make Glenwood Canyon so beautiful are also what make it dangerous. “Every material has an angle of repose,” observed Joe Elsen, a CDOT Program Engineer who has worked in the canyon since just after construction began in the 1980s. The sheer rock walls along the highway are well above a stable angle. Before the Interstate was even opened, Elsen helped with the removal of “the beehive,” a massive rock formation deemed a hazard. Halfway through the process, with 15 feet of rock on the road, workers got word that a woman in labor was on her way to Valley View Hospital from the Gypsum side. Elsen met the ambulance and took the woman down a section of the Colorado River in a boat to bypass the blocked roadway. Overall, Elsen doesn’t think Glenwood Canyon is more dangerous than any other mountain highway. CDOT has put considerable effort into structural reinforcement and rock scaling. The state has even attached sensors in problem areas to give warning of an impending slide. The rest is up to the drivers.